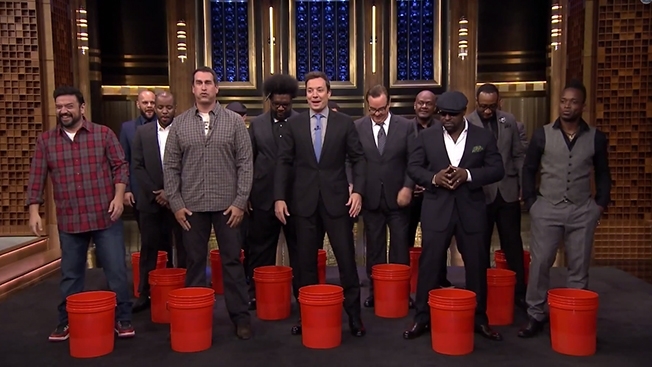 Guys like Jimmy Fallon (center), Rob Riggle (left), Horatio Sanz (far left), and The Roots have all participated in the ALS ice bucket challenge. Usually on my blog I like to talk about big things going on in sports and give my opinion on them. In the two months I’ve been writing, I’ve covered a wide range of topics, covering the NFL, MLB, NBA, and even WWE. But for this post, I want to change it up. This post is not about any big sports story going on, but yet a challenge that has taken over the world. That, of course, is the ALS ice bucket challenge. The worldwide phenomenon has raised the most awareness for ALS anyone has seen, as $22.9 million had been raised this month, which is 12 times the amount of last August already. The number could easily reach $30 million by the end of the month. There have been 2.4 million videos posted of the challenge and a total of 28 million mentions of it on Facebook since June 1. Again, those numbers are increasing every day as well. Now I know the actual act of dumping an ice cold bucket of water over your head isn’t going to cure ALS, but the ice bucket challenge is more then that. It’s creating awareness for a disease that maybe not many people knew about before the challenge began. Everyone, from your local high school teachers to former president George W. Bush, has been taking the challenge and raising money as well. The numbers speak for themselves. But this post isn’t all about the other facts on ALS, what it does, how many people it affects, etc. You can look it up at alsa.org (and while you’re there, donate money to ALS research). Instead, I want to talk about the real impact of the challenge and try to stop the people who try to degrade it and make it seem like a dumb thing to do. For some reason, there are people who think the challenge is stupid or meaningless. Let me give you an analogy: the ice bucket challenge to ALS is like wearing pink for breast cancer in October. Does actually wearing a pink shirt help find a cure for breast cancer? No. But more money is donated to breast cancer in the month of October then any other month of the year. The NFL even wears pink gear they auction off to help donate to research. Do you see anyone bashing people when they wear pink? No. In fact, a lot of people end up wearing pink in the month to show their support. What makes dumping water over your head any different? The only difference is that you’re going to be wet and cold for a little bit, and that’s it. Does wearing a puzzle piece pin in January actually help find a cure for autism? No way. It does, however, raise awareness for the disease, thus increasing donation money to someday help find a cure. And it’s not like if you do the challenge you don’t have to donate money. You’re supposed to donate $10 if you do it, and if you get challenged and don’t do it, you have to donate $100. So no matter what, money is being donated to ALS through this challenge. I did the challenge and then donated $20 to alsa.org. Although $10 or $20 may not seem that much, every dollar towards research counts, and when you have millions and millions of people donating, the number of dollars raised increases significantly. Finally, I wonder how many people with ALS don’t like the challenge, because I think you’d be hard pressed to find someone with the disease that doesn’t like the challenge. This is by far the most our nation has ever talked about ALS, and the disease has taken center stage for awareness over cancer. Do you think the people with ALS are objectifying to the amount of money raised for research? Those people would be willing to do anything to have their normal lives back and not go through the pain ALS brings, and now people all across the world are trying to help them. The 30,000 Americans with ALS are seeing the challenges and the money raised increase everyday and are happy because one day there may be a cure. It may not help people with ALS now, but it could help future people with ALS, and that’s a great feeling to have. So does dumping water on your head really help find a cure for ALS? No. But most campaigns for every other disease don’t actually help either. The awareness and donation of money from those campaigns help, though, and the numbers don’t lie when looking at awareness and donation money of ALS in the past month. So keep the challenges coming. Let’s see how much money we can actually raise as to help find a cure for a disease that has killed too many people. Who knows, maybe all the dumping of water on our heads will pay off and one day we do find a cure. Until then, let’s try and #StrikeOutALS once and for all.